The Tuscan Grille located onboard the luxury Celebrity Cruises - Eclipse cruise ship is a harmonious blend of steakhouse and Italian favorites. 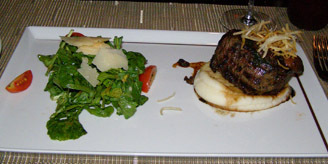 Excellent cuisine and professional and attentive service made for a delicious evening of dining. A wall of windows dressed with scalloped window treatments provided the perfect backdrop to watch the sunset from the butterscotch leather wingback chairs that flanked the dark wood tables that were smartly dressed with tan woven placements, red water glasses, and red votive candles. Striped banquettes provided intimate seating, contemporary reddish orange oval ceiling fixtures, hanging lamps, and recessed fairy lights softly illuminated the room, while low background music completed the ambience. 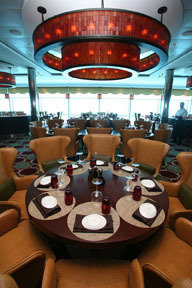 Edward and I had a lovely dinner at the Tuscan Grille in November 2010 while we cruising on the Celebrity Eclipse. Our attentive waiter, Ciprian began our evening with a basket filled with an assortment of Italian bread, breadsticks, and foccaccia laden with pesto and grilled tomatoes. 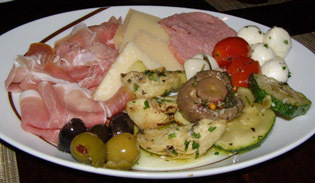 We continued with a Primi Piatti of Antipasti, which featured a selection of cured meats, generous wedges of parmesan cheese, marinated mozzarella balls, roasted red peppers, grilled zucchini, marinated garlic cloves, and assorted green and black olives. Paired with a bottle of Morandé Reserva Merlot, 2008, 14% abv, from Casablanca Valley, Chile, a medium-body, deep red aromatic wine with dark fruit, chocolate, and spice on the nose, and a lovely finish with hints of vanilla on the palate we were off to a great start. Edward continued with the Bistecca Tartare (Steak Tartare) made with Classic Dijon mustard, capers, parsley, onion, parmesan cheese with black pepper vinaigrette, presented in a crisp potato "cup." Sliced Italian bread and an arugula salad topped with generous slices of parmesan completed this course. The waffle cut crispy fried potatoes were an interesting, and appetizing textural addition to the steak tartare. 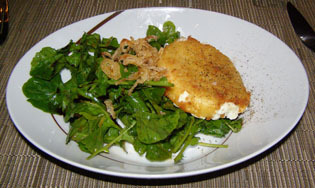 I had the Insalata di Arugula (Arugula Salad) a generous salad made with arugula, lightly breaded and fried goat cheese, toasted pine nuts, and topped with crisp shallots, with a sun dried tomato vinaigrette and balsamic syrup. This was a lovely light course with nicely contrasting textures and flavors. For his main course, Edward went with the steakhouse tradition with Filletto Mignon Rustico (Rustic Filet Mignon), which was filet mignon paired with horseradish mashed potatoes, porcini mushrooms, arugula and Barolo sauce, which was another excellent course where the flavors melded together beautifully. 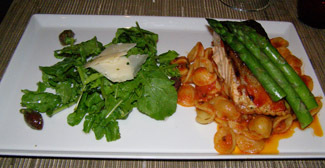 I selected the Trancio di Salmone, which was a generous portion of pan-seared salmon topped with tender grilled asparagus, with al dente orecchiette pasta tossed with tomato sauce laden with artichokes, olives, grilled asparagus, and accompanied with an arugula salad with lemon vinaigrette. Decadence continued with Italian Dolce (dessert) of Chocolate Fondue for Edward presented in a red cast iron pot filled with rich melted dark chocolate with sliced bananas, strawberries, pineapple, a chocolate brownie, and marshmallows to dip, and for me, a luscious Tiramisu accompanied with chocolate drizzled on the plate. Read about Celebrity Eclipse in the Destinations, Restaurants, Chefs' Recipes, and Spas sections. For information on the Celebrity Eclipse and Celebrity Cruises, Inc. please visit the website: www.CelebrityCruises.com.